As a zoology and biology teacher, Reedy practices what he preaches by conducting field research, then building field-based curriculum for his students. In 2008, as a Fund for Teachers fellow, Reedy paddled a kayak more than 1000 miles down the lower Mississippi River to study nutrient pollution and design a field-based river ecology unit for high school students. His writing and photographs have appeared in Sea Kayaker Magazine, Wavelength Paddling and on GoNomad.com. “This unique professional development opportunity completely changed my concept of science education and convinced me that all science teachers need to be scientists and kids need to DO science,” he says. His methods are getting attention. This year, he presented at TED 2012 in Long Beach. 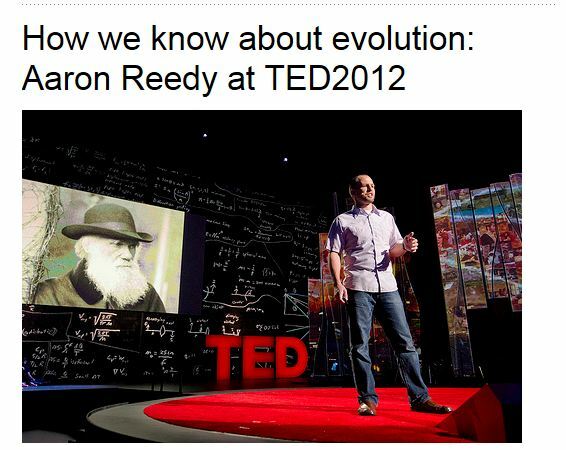 His talk “How We Know about Evolution,” is “aimed at the most curious students who find the story of how we know things just as interesting as the things we know,” says Reedy. Here, Reedy shares his thoughts on project-based learning in public schools, using technology in the classroom, and why he believes standardized testing is failing our kids. Tell us how your professional achievements have advanced innovation in education? I’m always hesitant to answer this question because I’m not sure that my methods are truly innovative in the sense that they are completely original. I really just use project-based learning, inquiry science, and good old-fashioned lecture. I think the innovative things that have happened in my classroom are really just how far we have been able to push the scale and standards of project-based learning at the high school level. That has happened in large part through the relationships I have been able to establish with some of the best working scientists out there. Last year with funding from the NSF and the support of the Janzen Lab at Iowa State University and Dr. Dan Warner, we conducted a study of nest site selection in lizards in the classroom. The experiment involved more than 100 lizards in 30 controlled enclosures with lizards hatching out of the incubator almost daily. For species that lay eggs, we learned new things about the effects of the choice that a mother makes when she chooses a nest site. It was just a lot bigger than the science labs most people trust kids to do, but it worked and the findings of my students will make a small, but original contribution to the scientific literature of maternal effects. Recently, our findings received provisional acceptance for publication in Behavioral Ecology. This may be the first time ever that science done entirely by kids in a high school classroom will be published in a professional, peer-reviewed science journal. I hope that this changes the idea of what is possible for scientists and teachers in a way that establishes new possibilities for high school science education. I also really hope that it blurs the lines between outreach and research for working scientists. I think that many teachers don’t have working relationships with professional scientists and many researchers aren’t fully committed to outreach because they don’t see it as related to research. I hope that others can look at The Lizard Project and the collaboration between myself and Dr. Dan Warner (University of Alabama-Birmingham) and say, ‘There is a real possibility to both advance my research and communicate science to the public at the same time, in a really meaningful w­­­­ay, if I take the time to cultivate relationships with science teachers.’ I would be thrilled if my work could be a part of making that happen. There is a serious lack of resources in the public schools right now and structures to the school day that do not support large-scale, project-based learning. There is also this intense pressure to standardize your curriculum. It is easy to say that the public school system does not encourage great project-based learning. I would tell teachers to do the best that they can, to ignore those obstacles and find ways to get kids DOING science. Don’t give in to the pressure to teach a course geared to standardized testing. Be a bit subversive if you need to be. Hold yourself to the standard of, “Would I want my own kid to be in a science class like this?” If the answer to that question is yes, then I think you should ignore all of those other pressures. I have found that when you have a class full of students excited about learning, those pressures to standardize your curriculum tend to fall by the wayside. People tend to get out of the way when you are busy doing good work. It’s easy now to connect kids to the entire science community. When I was in the field doing evolutionary biology fieldwork on our islands, I was able to Skype from my phone with classrooms around the country. We would be catching lizards on an island in an estuary in Florida and suddenly we were showing that world to a class of 4th graders in Alberta, Canada or high school kids in Tennessee or Chicago. The best part is that it isn’t passive technology. The kids were right there with us and were asking questions in real time. I work with Dr. Dan Warner who is a really great scientist. Dan really believes in the importance of doing education outreach, but that doesn’t mean that he has the time or money to be flying around the country to be talking with school kids. With a technology that is cheap and readily available in our pockets, I can connect my students with a scientist like Dan, while he is working on his research goals in the field. Stuff like that helps to generate the most important part of science education, curiosity. The lack of basic structural resources is a huge problem for schools. People want to get excited about innovative education, and I get that. That is the kind of thing that gets me excited too, but the truth is that the biggest obstacle to education for the majority of our nation’s urban schools is heartbreakingly simple. We need new facilities. We need better physical spaces for learning. My school is largely without air conditioning and temperatures frequently exceed 100 degrees in classrooms in the spring and fall. Over the years, I have routinely taught classes that had 40 to 45 kids in rooms that only had desk space for 30. Up until the last two years, my school had roughly 150 computers available for 3,300 students. People don’t want to believe that these things are problems in American schools, but they are, and until those basic needs are taken care of, it seems out of touch to focus on any other aspect of improving our urban schools. Unfortunately, I think that people are looking for a way to get more with less. This rarely works. If we are serious as a state and a country about improving education, we need to be asking about how we can divert more resources into education. The things you invest in are the things that you do well. We need cultural change. Education needs to be valued more. Learning needs to be viewed as a worthy goal in and of itself. If you look at communities and societies where that is happening, you find well-funded schools that are succeeding. When the focus is on test prep and performance rather than on what that performance is supposed to measure, success by the numbers will always be an illusion. Classroom teachers have an enormous opportunity to innovate. Every day there is the opportunity to teach students in any way that a teacher can dream of. In the right school setting, teachers are free to create in ways that build on their individual passions for their subject areas. Teachers are in the best position to discover the things that will make the biggest impact in student learning. Don’t spend too much time trying to figure out what is the best way to use the limited resources that are present. Instead, spend your time thinking about the very best way to teach and inspire if money were no object, and then try to make that happen with whatever you can get your hands on. I think that it is a positive that education is a hot topic at the moment. People are talking about it more than ever. In the long run I think that is going to go a long way towards exposing the segregation and inequality in our education system. That will ultimately be good for students and will be good for society. I think that the recent trend towards a standardization of curriculum is getting in the way of learning. All of my best work would not exist in a standardized curriculum. Standardization works for factory parts, but it is not good for inspired learning. I would give every student a well-designed and inspirational space for learning. Sometimes it doesn’t get thought of as a tool, but the physical space where learning happens is perhaps the most important learning tool. It needs to be flexible, durable, well maintained and above all it needs to be the kind of place where kids feel inspired to think hard about big problems. Website I check every day: Twitter- if you follow the right people, it is like a science and education conference 24/7. Person who inspires me most: My wife Sarah. She makes everything and everyone around her better. Favorite childhood memory: Running wild and exploring the unknown in the woods behind our house when my family lived in Cedar Rapids, Iowa. We built tree forts, went fishing in creeks, caught snakes and frogs and generally lived a wild existence every summer in the 70-acre park behind our house. Next travel destination (work or pleasure): It will almost certainly be to the field research site where I have been working in Florida. We work on nine study islands in the intra-coastal waterway. We get to the islands by kayak. The estuary is beautiful and we see dolphins and manatees all the time. It is not a bad place for a work trip. When was the last time you laughed? Why? Yesterday, I drove three of my students to a summer field internship in biology. Those kids had me cracking up the whole way there. Favorite book: One of my favorites is Eiger Dreams by Jon Krakauer. It’s a book about dreaming of adventure in the mountains and I read it at a time in my life when I lived for adventure in the mountains. Favorite music: Drive-By Truckers. Best songwriters out there currently making rock and roll. This entry was posted in Beyond the Classroom, Change Management and Culture of Innovation, Information, People, Personalized Learning and tagged Education, Teacher, Zoology. Bookmark the permalink.